Yarn kits There are 3 products. 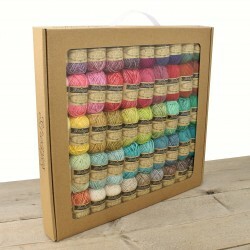 Scheepjes Catona Colour Pack includes 109 mini balls of Scheepjes Catona 10 grams each in all existing 109 colors. 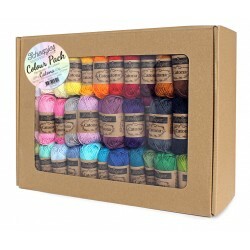 Ideal option for those who makes amigurumi, jewelry and other small things in different colours, as well as for those who want to get acquainted to Catona colour palette. Scheepjes Stone Washed River Washed Colour Pack includes 36 mini balls of Stone Washed and 14 mini balls of River Washed 10 grams each in all existing colors. Ideal option for those who makes amigurumi, jewelry and other small things in different colours, as well as for those who want to get acquainted with colour palette. Scheepjes Catona Studio Pack includes Catona Colour Pack (109 balls 10g each), 2 magnetic boards (70x40 and 40x30 cm), 10 magnetic clips, Scheepjes storage tin, magnetic tape and Scheepjes Catona shade card strips. This is an ideal set for knitwear designer. You can put colour strips on the board and easily search for the best combinations.